Everyone knows grilled cheese sandwiches taste better when the edges are sealed like a pie (just ask the Australians about “jaffies”). But no one wants a space-hogging electric gadget destined to break. 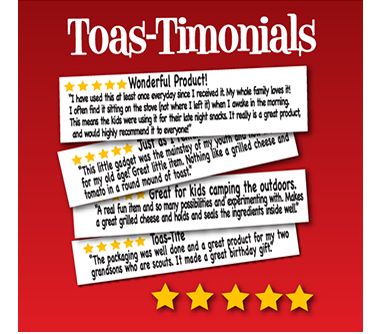 Enter the Toas-Tite sandwich maker, a refreshingly low-tech way to make round, pudgy, portable hot pockets of toasty goodness with whatever heat source you have handy – from a fireplace or campfire to an electric or gas burner. Wildly popular in the 1950s, vintage versions are common on Ebay, where they sell for anywhere from $12 to $100. But the irons are clearly making a comeback, with a line of brand-new replicas that launched in September (toastite.biz). We recently picked up a vintage version for $15 and can’t stop making cheesy-egg breakfast sandwiches. Nutella-filled treats and tuna melts. It even makes plain-old PB&Js taste better. 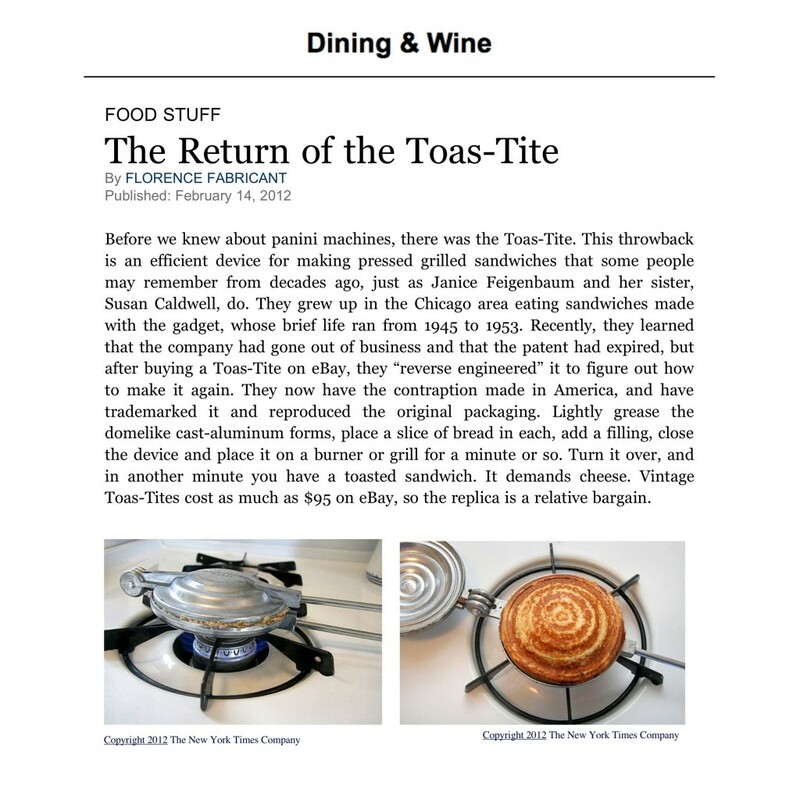 For more recipe inspiration check out toastiterecipes.com, where a young California couple use their extensive collection of Toas-Tites with everything from toaster waffles to phyllo dough. 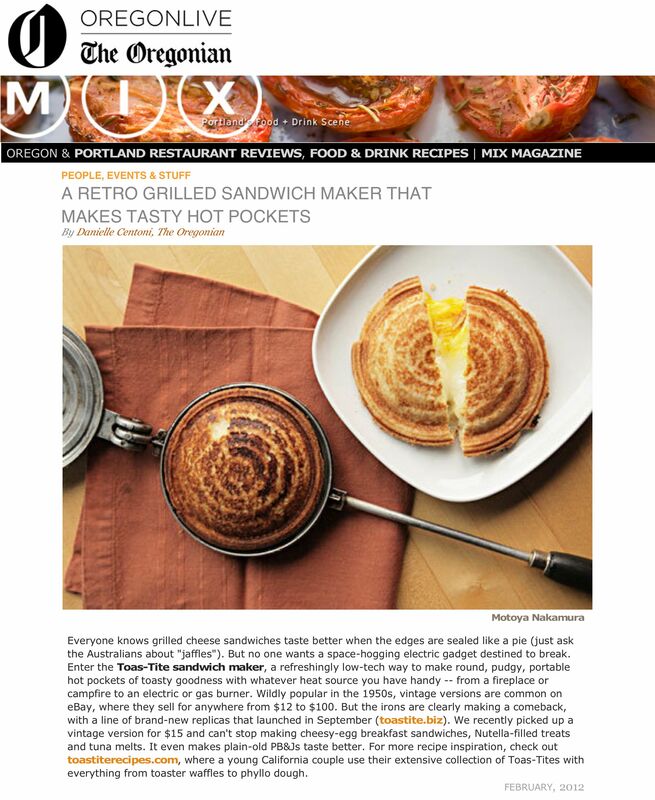 Imagine a contraption that allowed you to make a grilled cheese sandwich without plugging anything in or dirtying a pan. Yep, it’s a Toas-Tite! If you’ve ever used one of these retro gadgets, you already know the magic behind their perfect circular sandwiches. Until recently, however, they were hard to come by. Search no longer! 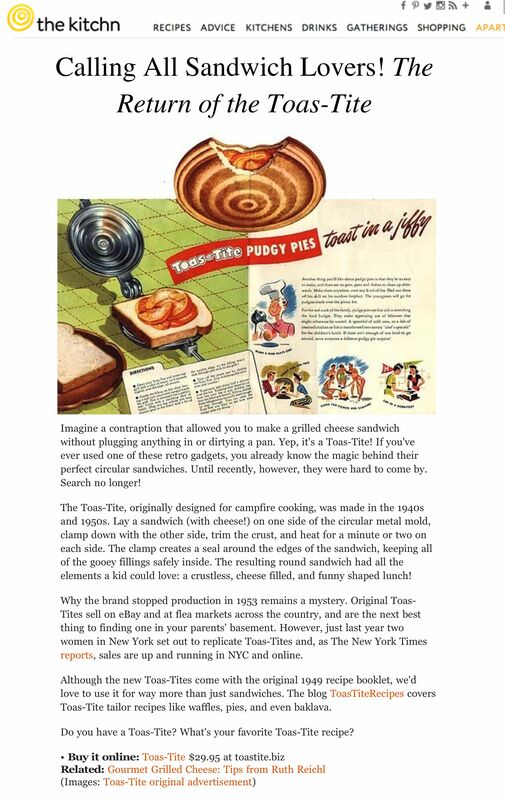 The Toas-Tite, originally designed for campfire cooking, was made in the 1940s and 1950s. Lay a sandwich (with cheese!) on one side of the circular metal mold, clamp down with the other side, trim the crust, and heat for a minute or two on each side. The clamp creates a seal around the edges of the sandwich, keeping all of the gooey fillings safely inside. The resulting round sandwich had all the elements a kid could love: a crustless, cheese filled, and funny shaped lunch! Why the brand stopped production in 1953 remains a mystery. Original Toas-Tites sell on eBay and at flea markets across the country, and are the next best thing to finding one in your parents’ basement. However, just last year two women in New York set out to replicate Toas-Tites and, as The New York Times reports, sales are up and running in NYC and online. 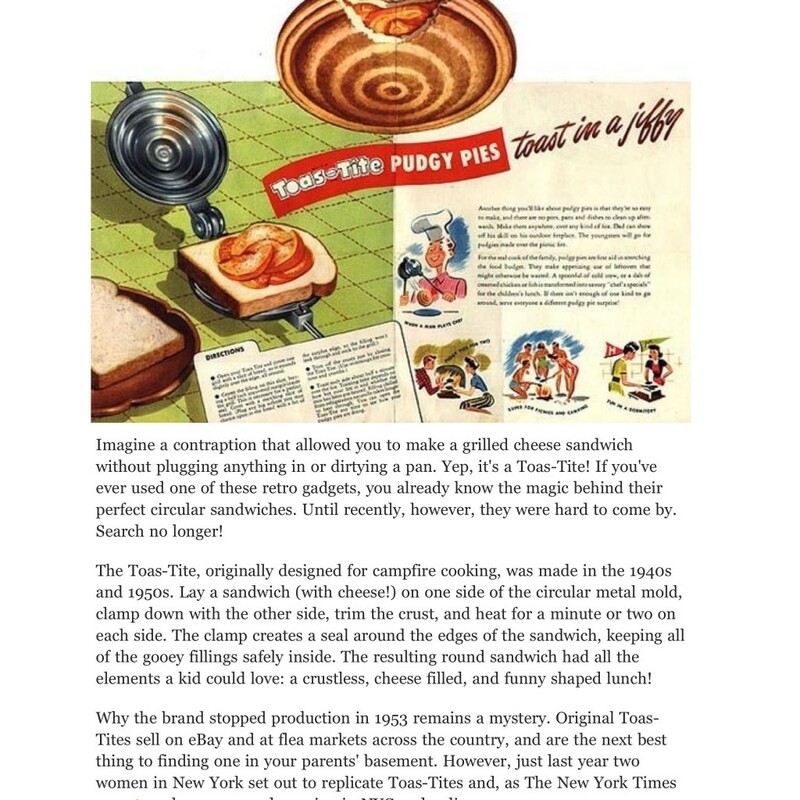 Although the new Toas-Tites come with the original 1949 recipe booklet, we’d love to use it for way more than just sandwiches. 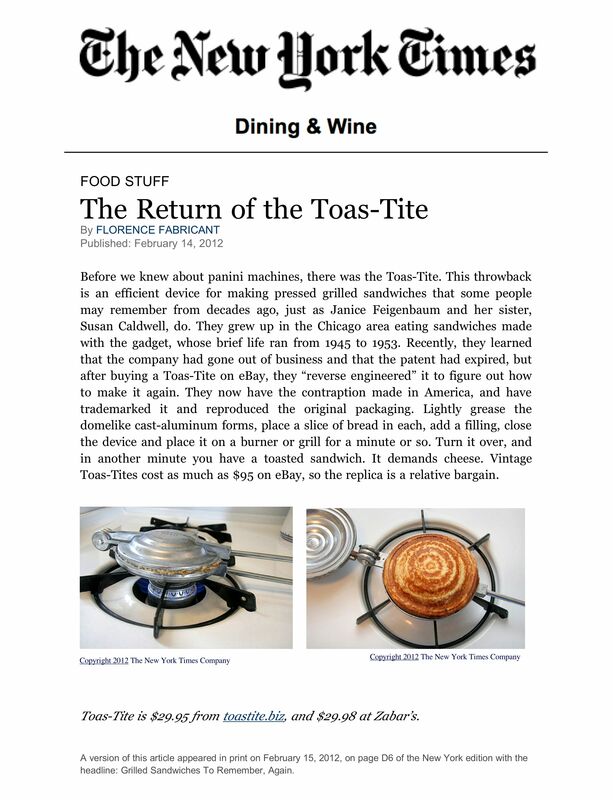 The blog ToasTiteRecipes covers Toas-Tite tailor recipes like waffles, pies, and even baklava. Do you have a Toas-Tite? 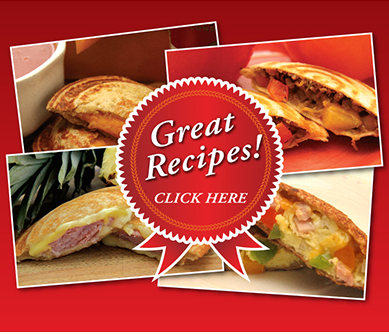 What’s your favorite Toas-Tite recipe? Before we knew about panini machines, there was the Toas-Tite. This throwback is an efficient device for making pressed grilled sandwiches that some people may remember from decades ago, just as Janice Feigenbaum and her sister, Susan Caldwell do. 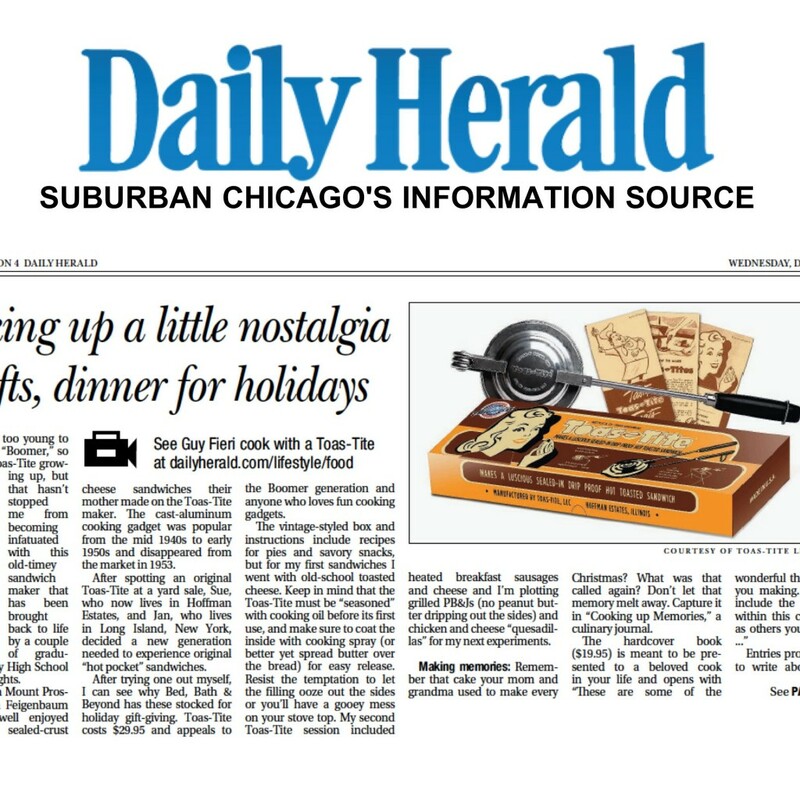 They grew up in the Chicago area eating sandwiches made with the gadget, whose brief life ran from 1945 to 1953. Recently, they learned that the company had gone out of business and that the patent had expired, but after buying a Toas-Tiite on eBay, they “reverse engineered” it to figure out how to make it again. They now have the contraption made in America, and have trademarked it and reproduced the original packaging. Lightly grease the domelike cast-aluminum forms, place a slice of bread in each, add a filling, close the device and place it on a burner or grill for a minute or so. Turn it over and in another minute you have a tasted sandwich. It demands cheese. Vintage Toas-Tites cost as much as $95 on eBay, so the replica is a relative bargain. I’m a wee bit too young to be considered a “Boomer,” so I didn’t use a Toas-Tite growing up, but that hasn’t stopped me from becoming infatuated with this old-timey sandwich maker that has been brought back to life by a couple of graduates from Hershey High School in Arlington Heights. 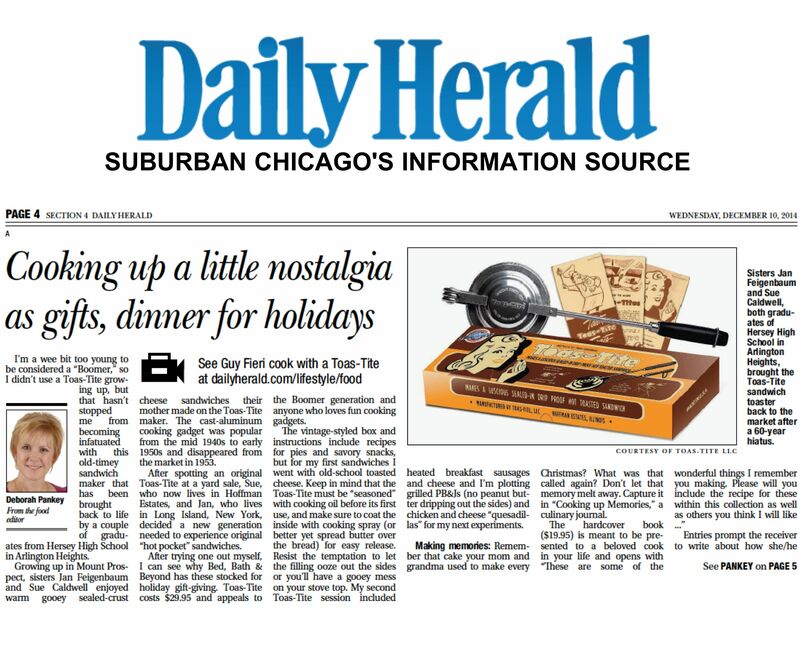 Growing up in Mount Prospect, sisters Jan Feigenbaum and Sue Caldwell enjoyed warm gooey sealed-crust cheese sandwiches their mother made on the Toas-Tite maker. The cast-aluminum cooking gadget was popular from the mid-1940s to early 1950s and disappeared from the market in 1953. 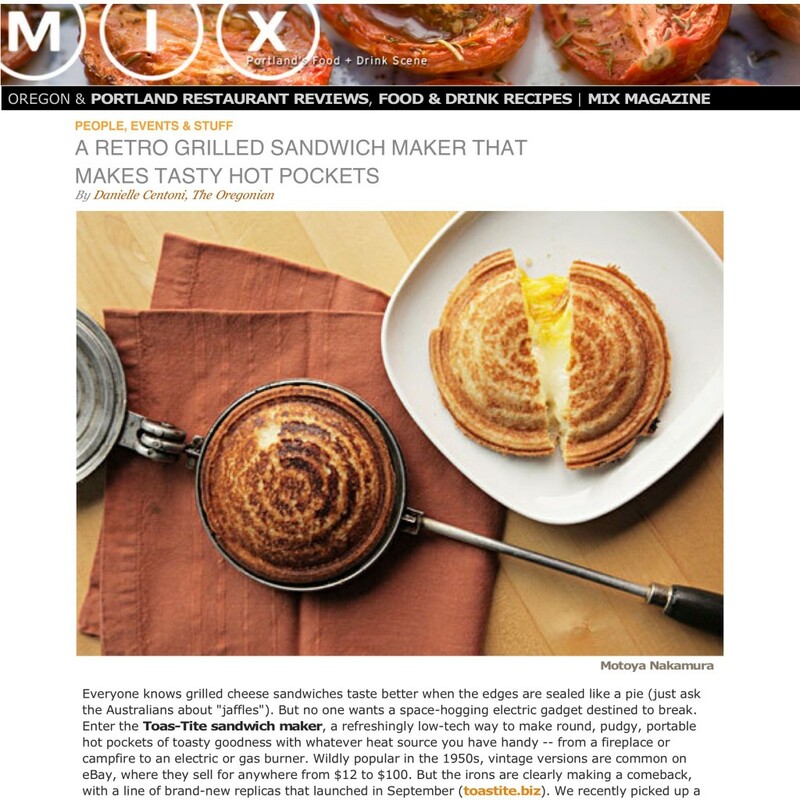 After spotting an original Toas-Tite at a yard sale, Sue, who now lives in Hoffman Estates, and Jan, who lives in Long Island, New York, decided a new generation needed to experience original “hot pocket” sandwiches. After trying one out myself, I can see why Bed, Bath & Beyond has these stocked for holiday gift giving. 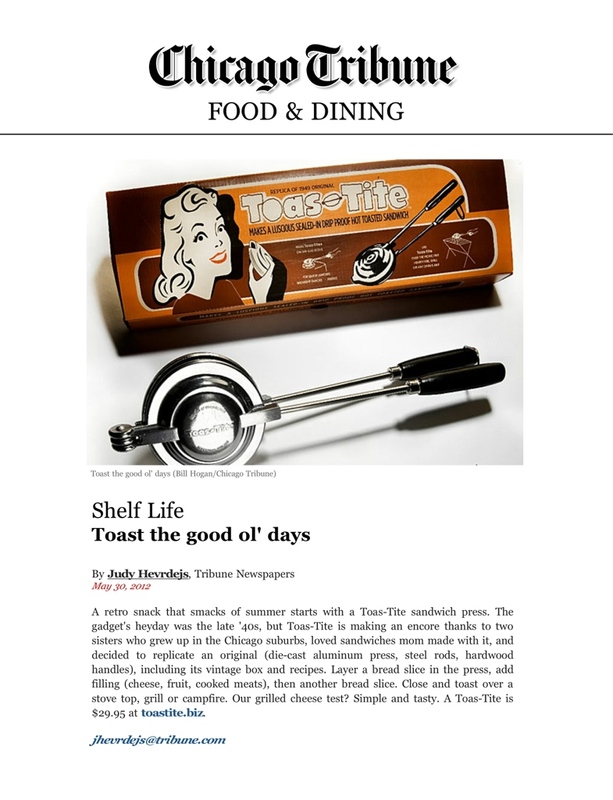 Toas-Tite costs $29.95 and appears to the Boomer generation and anyone who loves fun cooking gadgets. The vintage-styled box and instructions include recipes for pies and savory snacks, but for my first sandwiches I went with old-school toasted cheese. Keep in mind that the Toas-Tite must be “seasoned” with cooking oil before its first use, and make sure to coat the inside with cooking spray (or better yet, spread butter over the bread) for easy release. Resist the temptation to let the filling ooze out the sides or you’ll have a gooey mess on your stove top. My second Toas-Tite session included heated breakfast sausages and cheese and I’m plotting grilled PB&Js (no peanut butter dripping out the sides) and chicken and cheese “quesadillas” for my next experiments. — Food Editor Deborah Pankey. 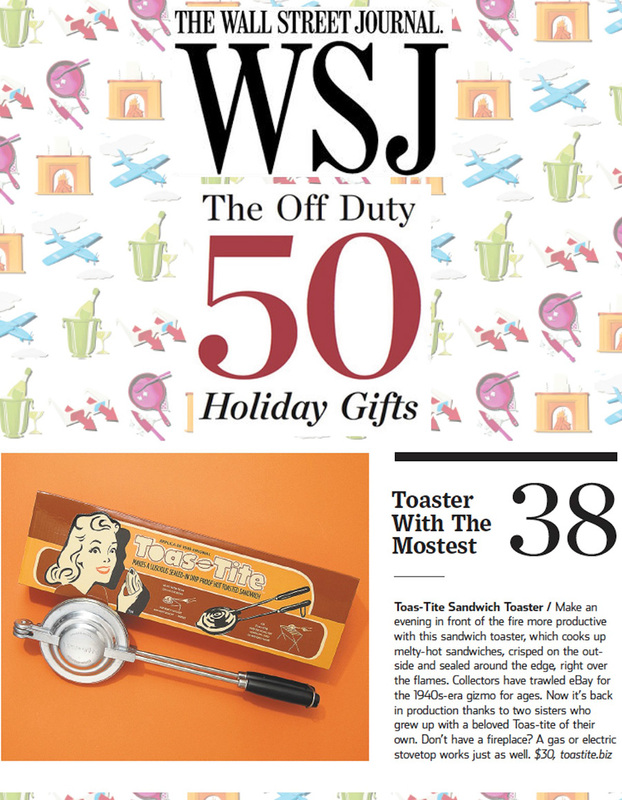 A retro snack that smacks of summer starts with a Toas-Tite sandwich press. 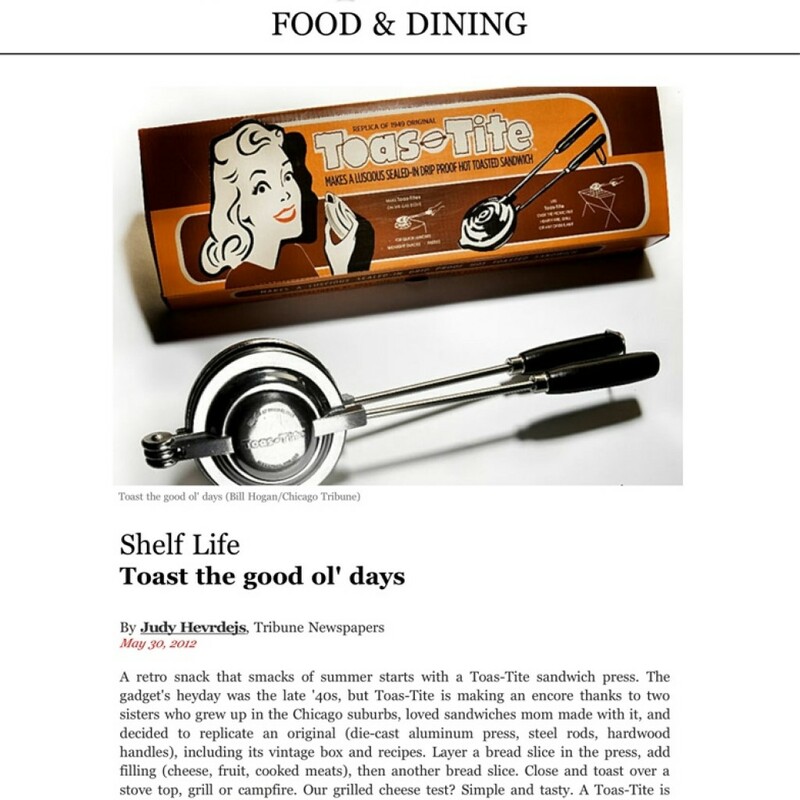 The gadget’s heyday was the late ’40s, but Toas-Tite is making an encore thanks to two sisters who grew up in the Chicago suburbs, loved sandwiches mom made with it, and decided to replicate an original (die-cast aluminum press, steel rods, hardwood handles), including its vintage box and recipes. Layer a bread slice in the press, add filling (cheese, fruit, cooked meats), then another bread slice. Close and toast over a stove top, grill or campfire. Our grilled cheese test? Simple and tasty. A Toas-Tite is $29.95 at toastite.biz.